Brazil’s most prominent psychiatrist, Dr. Valentim Gentil, a professor at the Instituto de Psiquiatria, invited Pete to give several lectures to doctors, lawyers, students, and politicians in Sao Paulo and Brasilia after CRAZY: A Father’s Search Through America’s Mental Health Madness was published in Portuguese. Brazilians are interested in the issues raised in Pete’s book, especially the closing of state hospitals without creating adequate mental health care services in communities. The Brazilian Ministry of Health has been under the leadership of anti-psychiatry officials for several years and has been closing mental hospitals. During the 1960s, Thomas Szasz directed what became known as the anti-psychiatry movement in the US. He claimed mental illnesses were not biologically based brain disorders but myths created by psychiatrists. As explained in Pete’s book, Szasz described schizophrenia, bipolar disorder, and major depression as alternative ways of thinking. Overseas, Michel Foucault in France, R.D. Laing in Great Britain, and Franco Basaglia in Italy, championed many of the same anti-psychiatry rhetoric. About a decade ago, Brazil began applying Basaglia’s Italian doctrine. The head of its Ministry of Health has stated publicly that all hospitals should be closed because there is no mental illness in Brazil. The translation of Pete’s book — Loucura: A Busca De Um Pai No Insano Sistema De Saude — sparked debate between anti-psychiatry leaders and Pete after Brazil’s Procuradoria Geral da Republica (the equivalent of the U.S. Attorney General of the United States) invited Pete to lecture in the nation’s capital to Brazil’s national legislature. Pete’s remarks were simultaneously translated and broadcast on national television. Afterwards, he answered questions from anti-psychiatry officials and explained that neuro-transmitter discoveries and schizophrenia twin registries have offered support that schizophrenia is biologically based. He added that the National Institutes of Mental Health classifies schizophrenia, bipolar disorder, and major depression as medical illnesses and diseases. Veja, the largest magazine published in Latin America with 1.3 million readers, published an article about Pete‘s visit, book, and his calls for reform. Dr. Gentil appeared with Pete at several lectures and noted that in Sao Paulo City (population 12 million) there are more than 1,500 persons with chronic schizophrenia who are not being treated because of a lack of services and 15,000 homeless, most with untreated mental illness. The American writer Pete Earley, of 57 years, specializes in the judiciary of his country. The most recent of his twelve books is based on personal experience. 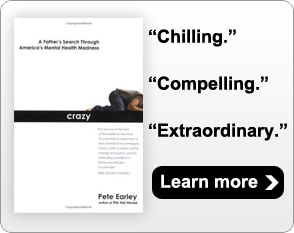 Just published in in Brazil, CRAZY: A Father’s Search Through America’s Mental Health Madness (Artmed, 375 pages) tells the story of his son Mike, who has bipolar disorder. Besides telling the story of a sensitive father faced with the illness of a child, Earley writes critically about how U.S. laws deal with the mentally ill. Reforms during the 1960s, closed state hospitals, causing thousands of psychiatric beds to no longer exist and a majority of patients to be left untreated – a situation which Brazil now faces. At the invitation of the Institute of Psychiatry, University of São Paulo, Earley spoke and engaged in a series of debates about this problem last week. Before embarking for Brazil, he was interviewed by VEJA reporter Adriana Dias Lopes, from his home in Fairfax, in the state of Virginia. The first symptoms appeared in 2000, when Mike was 22 years old and studying in the school of arts at the Pratt Institute in New York. One weekend he called his father and said that he had taken five homeless men to breakfast at McDonald’s because he wanted to talk to them. Soon after that, Mike said he was not sure whether he had actually taken the men to breakfast or dreamed it. His father took Mike to see a psychiatrist. After examining Mike, the doctor said that if Earley was lucky, his son was using illegal drugs because the alternative was that he had a mental illness. After the episode at McDonald’s, Mike went to see a psychiatrist twice. But stopped going because he did not believe he was ill, only that he needed to eat better foods. For a while, he seemed well and the family decided it was a fluke. For nine months everything was fine and then one day Mike had a serious break. He became sick and broke into a house when there was no one at home. He went into the bathroom and took a bubble bath. The homeowners decided to press criminal charges again him even though he was sick. He was charged by the police with a serious crime. The prosecution could mark him forever as a criminal and would have serious repercussions. Fortunately, a female police officer helped his son and he was found guilty of a lesser crime. A year later, the police officer was murdered by a 18 year old man with mental problems. People tell Earley not to help his son. They said he must let his son hit rock bottom, then Mike will figure out that he must take medicine. Only if he hits rock bottom will Mike finally understand that you must follow the treatment on a regular basis. These people do not realize that letting an ill person hit rock bottom could mean that the person will end up committing suicide, Earley said. Studies show a high percent of persons with bipolar disorder try to kill themselves. The patient really believes that he can be fine without medication – that is another characteristic of the disease. People say that a person with mental illness has the right to be crazy and be homeless on the street and psychotic. But these people do not feel that way about someone who has Downes Syndrome. The parents of a child with Downes Syndrome are never criticized for advocating for their children. Children with Downes Syndrome are not allowed to be homeless on the streets. But both Downes Syndrome and bipolar disorder are brain disorders. In the US, a patient can not be treated against his will unless he becomes dangerous and poses a risk to himself or someone else. In the United States, nobody can be involuntarily confined for more than 72 hours without having the right to appear before a judge with a lawyer, with the exception of the perpetrators of very serious crimes such as murder. At that hearing, a judge decides whether the person should be taken to a hospital against their will. The U.S. courts have ruled that unless a person is immediately dangerous, they can not be forced to get help. For example, a man with schizophrenia who eats his own excrement can not be detained in a hospital because eating feces is not an act dangerous — that is what a judge ruled. Mike was doing well when the book published in 2006. But since then has had two serious crises. Both occurred after he stopped taking his medication. Mike refused to tell where he was but he agreed to drive home and with the help of others, we got him to take his medicine. I want what every parent wants for his son: a good job, a family and happiness. But it is difficult for Mike. He is currently without work and is not married. My priority is to help him stay well. Mike is lucky because he has brothers and sisters who love him and who will help him if he gets sick after his mother and I are no longer here.